Time for another of our monthly newsletters. 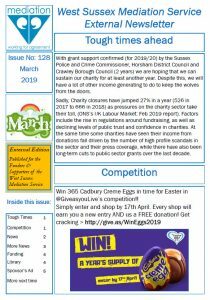 In this five page edition we provide a wide variety of news items covering funding, work experience and even a chance to win a year’s supply of Cadbury Cream Eggs! Remember to sign up to our regular updates by providing your email address in the box at the bottom of our ‘News’ page. To view the March Newsletter, click here or on the image below.